Back in 1991, dedicated soundtrack releases for Western game soundtracks were pretty much unheard of. One of the pioneers was Origin Soundtrack, a compilation of music from some of Origin‘s high-profile games of 1990/91. Exactly how Origin Soundtrack came about still remains a bit of a mystery. What seems to be confirmed is that the album is an unauthorised collection of music. Its producer and engineer was veteran composer Martin Galway, who had just finished work on Wing Commander II. His aim was probably to showcase his work and that of other composers at Origin on a stand-alone basis. Probably inevitably, the album was a mixed bag of offerings. Music from high-profile titles like Ultima VI: The False Prophet and Wing Commander II turned out to be surprisingly bland. On the other hand, Wing Commander’s pioneering, film music-inspired score made its album debut (if only with a six-minute medley). Nestled between these well-known games was a score that deserves much greater attention: Ultima: Worlds of Adventure 2 – Martian Dreams. Martian Dreams was part of the Ultima: Worlds of Adventure series that allowed Origin to get a bit playful with the venerable RPG franchise. Just look at Martian Dreams’ storyline, set in the Victorian era. Things kick off at the 1893 World Columbian Exhibition in Chicago with a steampunk-inspired rocket trip to Mars. Here, players meet Vladimir Lenin, Mark Twain, Nikola Tesla, Marie Curie, Rasputin and other prominent figures of the era. 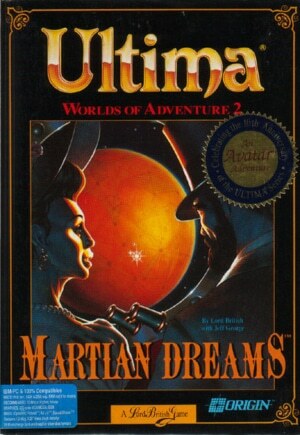 How to make sense of this narrative musically must have been a bit of a challenge for the composers of the Ultima: Worlds of Adventure 2 – Martian Dreams soundtrack: George Sanger, Dana Glover and Tom Hollingshead. Their music strikes the perfect balance between Victorian pomp, otherworldly evocations of Mars’ alien locations, and a good dose of fun and adventure. It’s obvious that the composers tackled the task at hand with great creativity and enthusiasm. This particularly obvious on Martian Dreams‘ eerie mood-building pieces that make the game’s Martian location a suitably alien place. “Turn Back the Clock” interestingly enough shows similarities to Ultima VI. Both works rely on plinking arpeggio figures, but “Turn Back the Clock” deploys these much more successfully. The cue leads several of these echoing arpeggios in chromatic harmonies over droning deep strings. The effect is winningly atmospheric – dream-like and even a little grotesque. “Below Ground” turns out even spookier. A ghostly woodwind lead plays over an uncanny rhythmic figure from a music box-like instrument with its glassy, hollow tones. The combination of timbres throughout the piece is simple, but creates striking unease. “Dream Combat” manages to transplant these unsettling sounds into a battle theme. Hollingshead deploys a shrill violin figure on top of a cantankerous tuba rhythm. It’s another example of the composers’ feeling for effective and creative orchestrations. True, the violin’s shrieks can become grating. However, they also give the music a convincingly surreal atmosphere, particularly when the violin drifts into a mad swirl. Other pieces are more conventional, but equally entertaining. “Main Theme” opens with a strident, upbeat march that has the requisite degree of Victorian pomp and circumstance to address the game’s period setting. In cinematic fashion, the piece suddenly moves into more dramatic strains, pushed forward by blaring fanfares and crisis motifs. Finally – and to great dramatic effect – the commotion dies down and only a harp melody over a suspended violin chord remains. “Daytime” starts out with a droll, amicable ditty that again retains enough stiff upper lip for the game’s Victorian setting. The music then blossoms into what sounds like a very well-developed town theme that feels both homely and adventurously enterprising. With “Daytime”, Sanger expands on his orchestral prowess displayed on Wing Commander. The cue’s flexible orchestrations, melodic complexity and its colourful and constantly changing textures surpass even that earlier soundtrack’s “Fanfare and Theme”. In its richness of moods and melodies, “Daytime” holds its own against the best JRGP town themes of its era. It’s no exaggeration to say that Sanger once more pushes the boundaries of orchestral writing for Western game scores. Not surprisingly, “Nighttime” returns “Daytime”’s slightly regal nature in a more relaxed manner. It also introduces a dreamy melody that is as charming as those found on “Daytime”, as well as a light dance feel in its constant, elegant string ostinato accompaniment. Finally, “Surface Combat” is a brief, but skilfully realised battle theme that covers a lot of ground during its short running time and calls players to arms with a resilient trumpet melody on the Ultima: Worlds of Adventure 2 – Martian Dreams soundtrack’s most action-focused piece. The Ultima: Worlds of Adventure 2 – Martian Dreams soundtrack is a rarely heralded stepping stone in the history of orchestral Western game music, emerging as the best Ultima score (George Oldziey’s intermittently gorgeous Ultima IX: Ascension is ultimately too inconsistent to claim that title). Within 15 minutes, Martian Dreams manages to create a multi-faceted, planet-hopping fantasy world. 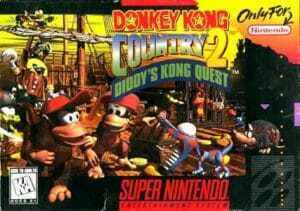 That the music is available for free through Good Old Games makes it an even more compulsory listen. Download for free from Good Old Games.